Page 43 of Rabbi Eli Friedman's book "The Great Mission: The Life and Story of Rabbi Yisrael Baal Shem Tov" contains a letter from the Baal Shem Tov to Reb Noach of Sudilkov on how to distribute tzedakah to Sudilkov's institutions. My natural curiosity concerning all things related to Sudilkov got the better of me and I looked in the footnotes of this book to determine the source of this letter. The footnote stated that this letter was first published in Warsaw in the Lubavitcher periodical "HaTamim". Researching this a bit further, I discovered that Rebbe Yosef Yitzchok Schneerson of Lubavitch used letters from the Kherson geniza as sources for "HaTamim". "In 1916, a bookseller named Naftali Zvi Shapiro offered to sell a scholar, Abraham Kahan, letters written by the Baal Shem Tov that had been stored in some geniza (cache of old documents). By 1918, rumors about this cache were circulating throughout Jewish eastern Europe and appearing in the Jewish press. There was confusion as to where the geniza was, in St. Petersburg, Kiev, or Kharkov. Finally, in 1921, the letters appeared in Odessa, having originated (supposedly) in the government archive in Kherson. The story was that in the confusion following the revolution in 1917, the letters were removed from the Kherson archive and brought to Odessa. There most of the letters were purchased by the hasid Shmuel ben Shneur Zalman Gurary and given to him to the leader of Habad Hasidim at the time, Rabbi Shalom Dovber. After piecemeal publishing efforts, in the 1930's his successor, Rabbi Yosef Yitzhak, published some three hundred letters, purportedly from the pen of the Besht or his family members and associates, in the Habad journal HaTamim. The discovery of the letters caused an initial rush of excitement among hasidim and academic scholars alike. It soon became apparent, however that the excitement was misplaced. Close inspection of the contents, form, and paper cast serious doubt on their genuineness, and today, outside of the Habad Hasidic movement, there are virtually no authorities who consider these letters anything other than forgeries." To establish the veracity of his claim, Rosman noted that scholars examined the letters in the Kherson geniza attributed to the Baal Shem Tov and matched up the dates to the day of week in which they were written. Upon completing their task, it was discovered that some of the dates coincided with Saturdays and other Jewish holidays in which writing is prohibited according to halacha. I further noted that the Gerrer Rebbe, Belzer Rebbe, and Munkatcher Rebbe all took issue with the authenticity of these letters and I could not find any sources outside of Chabad that suggested they were not forgeries. To the outside observer it appears that Chabad is being intellectually dishonest and choosing to look away from the truth when it is right in front of its eyes; it appears the Chabad's history is what Napoleon once called "a set of lies agreed upon." 1) Given the fact that it was found in the Kherson geniza, do you still think the letter from the Baal Shem Tov to Reb Noach of Sudilkov is authentic? 2) For the sake of historical accuracy, do you think the notion that a tzaddik is infallible should be put aside in order to remove other material (such as the succession story) from Chabad seforim that is based upon documents from the Kherson geniza? 1. Does the fact that there are surely inaccuracies invalidate the entire archive? 2. To what extent is it significant that the Previous Lubavitcher Rebbe (based on his father, the Rebbe Rashab, towards the end of his life) accepted them? 3. What is the standard for acceptable sources? 4. What should be the reader's perspective? Most of Chassidic tradition is legend – word of mouth transmission from generation to generation. Without question, information becomes corrupted and inaccuracies abound whenever history is transmitted in such a haphazard and unscientific manner; it is clearly impossible that every Chassidic story – even with the best intentions – is completely accurate. Nevertheless, it is important that we don't "throw out the baby with the bathwater" here – so, while errors will exist, that does not invalidate every story and every tradition. In this case, the Lubavitcher Rebbe took the position that there were mistakes in the documents (they were not 'originals,' they were rewritten copies), but while details may have been wrong, the general content was accurate. He also noted that while the Minchas Elazar was emphatically critical of the veracity of the documents, anyone familiar with the Minchas Elazar's style (the Minchas Elazar wasn't afraid to state his mind with strong language), would notice that his statements regarding the geniza are softer than one might expect. Also, we should mention that there were a few others, such as R' Gershon Henich of Radzin, who accepted them as legitimate as well. Furthermore, the Previous Lubavitcher Rebbe had many family traditions and information passed down from father to son, etc. Much of this information was not publicly known, and he was the first to publicize it. It seems that the Kherson archive fit and was supported by many of these familial traditions, which further lent credence to the content of geniza. And, the Previous Rebbe said, the profound Torah writings that were there further impressed him with the archive as generally reliable. Today, the scholars reject it completely – but that is not to say that scholars don't have their own agendas. Anyone who reads Rosman's book, for example, will be struck by his clear and overt dislike for Lubavitch, and his vitriolic, ridiculous, attack on the Mitteler Rebbe. Others too, who trumpet the unreliability of the Kherson geniza, can often be found to be generally opposed to Lubavitch. That's their right, but it does reflect motives beyond scholarly accuracy that influence their opinions. That said, the archive wasn't accepted by most authorities – and today it is virtually universally rejected outside of Lubavitch – and it does contain many acknowledged inaccuracies, impossibilities and unlikelihoods, therefore I agree that it should be given a lower status of reliability. Sefer Hatamim is full of information. I do not know for sure exactly which segments come form the Kherson geniza; nor do I know exactly which (or how many) pieces have clear inaccuracies. It would be nice if the entire archive was published, and inaccuracies pointed out, for inquiring minds to check out – otherwise, it casts a shadow of doubt over all the information that gets printed. I also think that it would be beneficial if truth-seeking scholars would research the documents and try to point out the strengths as well as the weaknesses there. But at least it should be acknowledged when the source for a printed quote is the (in)famous geniza. Of course there is a reason why it is not this way right now, which brings us to the main question: What do the words and opinions of a Rebbe mean to a chossid? And how should they be taken by someone who is not a chossid of that Rebbe? Good question. If a Lubavitcher publisher is compiling books on history, we can well imagine that he may – as a follower of his Rebbeim – consider their opinion on the geniza to be binding. And as a result, all Kherson documents are completely legitimate in his eyes. To this chossid, his Rebbe is not unlike Moshe Rabbeinu – therefore, if he said it, it must be true. To him, he would look at it not unlike a religious Jewish publisher being asked to add bible critics in his edition of the Chumash. Sadly though, this chossid's perspective, while understandable, remains almost inexcusable. If we completely disregard accuracy, the result is a world where truth and falsehood become indistinguishable. This damages the truth that exists, as it casts doubts over everything. It is important for individuals recognize which matters are above criticism and which are not. I might be getting into some trouble here... To me, Judaism doesn't have an infallibility doctrine (I think a different religion has that principle) for humans. A Rebbe is a teacher, a guide and a mentor. He is a spiritual giant. He exudes emunah and purity. We follow his guidance, we would be fools not to – he knows the terrain! Nevertheless, he is human. There are details unrelated to his area of expertise; which is not to say that Tzaddikim err in the same way as we do – there is a significant difference, beginning with purity of intent. Tzaddikim also experience a level of understanding and lofty knowledge that we can hardly dream of – indeed, without question, Tzaddikim are great and holy men – but nowhere is it written that they are all-knowing, Hanistoros l'Hashem Elokeinu. Prague was once a great Torah center, and when the rov passed away they sought a fitting replacement. Obviously this man would need to be a Torah giant, and to make sure that he was, the scholars would test every prospective applicant for the job: first the rov had to deliver a high-level Torah lecture and the scholars would try to disprove it – this was no easy task, not that unlike being thrown to lions. Should they be unable to find a hole in his lecture, they would start asking him legal questions that a rov would have to know. If he passed the questions he could be the new rov. However, each applicant that came to the test would eventually fail, so Prague went without a rov for some time. Eventually a young man, R' Yechezkel Landau, came to be examined. He did very well and the examiners just couldn't stump him, so finally they started asking him halachic questions that were so complicated that they could practically never happen – finally gave them an answered they didn't like. They began to shout, and brought out books to prove that he was wrong, and therefore unworthy to be rabbi in their city. "Ok," said the young man, "but first I'd like to explain something to you. You see, a rov is a human being, and humans can err. However, if a rov is honest and dedicated – if he does his utmost best to fulfill his role – the G-d protects him from mistakes. This is so that he shouldn't mislead his flock. However, you are asking me questions that are irrelevant – they never happened and they never will happen – therefore, there is no protection in that case, since my flock is not at stake, only my honor is. And for honor there is no special protection from above." And they took him to be their rov (later known as the Nodah B'Yehuda). I think that a Rebbe is no different. I also think that the Rebbeim found the overall message in those documents to be highly valuable. I think that the Yiddishkeit described in places like HaTamim is the most beautiful, inspiring and desirable way to live. This message is real – that much is undeniable. Are the details accurate? Some are definitely not, but I don't know which. But, if you are writing a history book and you are asking if it is it a reliable source for facts and details… I would have to say probably not. There is some letter from Rayatz stating that Hersoner Geniza is'nt reliable. Somoene asked the late Lubavitcher Rebbe about it, and he answered - too late to change it back or something the like. Do you know anything about it? I had heard that Berel Levin had said something like that... That he had found a letter from the Rayatz to some professor expressing doubts about the reliability of the geneiza, and that when he showed it to the Rebbe, the Rebbe supposedly said something along the lines of, "Reopening that case will do more harm than good." I dunno if it's true, or what the exact exchange was though. I wonder whether the letters have been submitted to scientific examination of the paper and ink, which might help date them. There are experts who authenticate antiques, paintings, and handwritten documents. The provenance (history of the trail of possession) is key. Comparison with the only confirmed letter from the Baal Shem Tov (the one to his brother-in-law, Gershon Kutover, in Palestine) for consistency of style and vocabulary would also be useful. But all that scientific investigation might only rule out an obvious forgery; the religious content would still have to be judged by a knowledgeable expert, so we are back to Square One, the rebbe who could make such a judgment. I won't venture a comment about infallibility. Oh, sorry, I see that you did mention close inspection of the contents, form, and paper. I wonder how long ago that study was done (modern methods might yield more accurate results). But we all know that "experts" disagree. Dating wouldn't help much, since they are claimed to be copies. The forgery could be done at the same time when the copying is claimed have happened. The investigation of the contents revealed too many problems, which gives the critics a strong basis to claim that it is a forgery. There to many examples - incorrect dates, strange similarity (stylistic analysis) of many letters supposedly written by different people (which strengthens the claim that it was forged by one person), incorrect and not found anywhere else usage of names and titles an so on and so forth. shalom. i'm glad i finally decided to take a look at your blog. i heard about you through the Lazer Brody website. It's a different topic for a different day... However, a Rebbe is a Rebbe. Not a doctor, not a dayan, not a novi - a Rebbe. The Ruzhiner dynasty cenetered in Vienna after the War also accepted the authority of the Kherson documents. They and some wealthy followers also purchased large portions of the collection. Mr. Frankel (a follower of this dynasty)of Vienna was also involved in their publication as was the infamous Reb Chaim Bloch later of th Bronx. Rabbi Hoffman of Bnai Brak wrote a tract aginst their authenticity after the War(second) As a Chabad person he was apparently censored by the rebbe for this. Does anyone know more about this incident ? 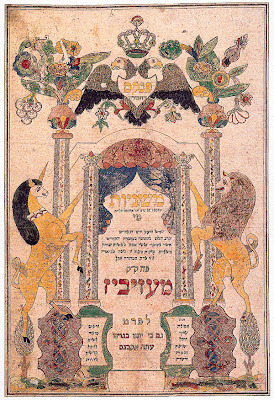 In general the period around WW1 was a period of forgeries : the Jerusalmi on Kodshim being another example. Some academic scholars have also accused the 6th Lubavitcher rebbe of indulging in similiar work in his historical writings concerning the BESHT and his period, and so called Memoirs. Dr. Adda Albert-Rappoport wrote a long essay on this subject , and otherscholars in Israel have also alluded to this. A bit earlier Reb Shmaryahu Schneersohn and his brother in law Teitelbaum with the help of Boris Schatz produced a phony portrait of the Baal HaTanya and in this case they were successful in passing it off as the authentic portrait. Some years alter a so called rebbe forged his identity and produced a Chassidic sefer under this identity that even fooled the Elde Admor in the US the sainted Monoshtritzer rebbe Rabbi Y.H. Rabinowitz. spodek-crowned charicature of a Chassidic court in Borough Park. I would not take these accusations as devoid of their own political agenda. Shneur: what is your agenda? Are you another disgruntled refugee of Crown Heights, or an impartial scholar? Smashed Hat. I am not here to indulge in personal attacks against Rabbi Deutsch or wealthy Hungarian Jews (as if there are no wealthy Lubavitcher people), or spodeks . The criticism against the Rayaatz was raised by a well known Israeli scholar of Jewish mysticism Dr. Ada Albert-Rappaport and was published in several well known scholarly journals. Her article was close to 100 pages long and well documented. The story of the Alter rebbe's portrait was not only written about in R. Deutsch's journal , but Bais Mashiach the Messianic Chabad journal had a multi part series about the portrait by the well known chabad researcher Shmulli Krauss.Krauss is the best of the young crop of Chabad researchers and a grandson of the well known Zalmanov Chabad family.The article even reproduced a letter by the Rayaatz wher ehe the rebbe comes dangerously close to admitting that the portrait is a fraud. Both of these issues have nothing to do with rabbi Deutsch or wealthy Hungarian Jews. Rabbi Deutsch's chief issue is not the rayaatz's historical writings or the Alter rebbe's portrait . Rather he is has raised the issue of a pseudo-Messianic takeover of the worldwide Lubavitch movement. Rather than have a discussion about the issues involved here, we are wittness to an atatck against a Boro park rabbi and activist. as a gift to the Rebbe Rashab. to be the sixth Lubavitcher Rebbe). the holiness within the object." In sefer hazikaron of R Moshe Lifschitz page 139-140 there is areport that R Chaim Lieberman, the famous bibliograph and literary critic, who was also the Riyatz's librarian and secretary (somewhat) said that he personally had met the forger of the kheson geniza letters etc. The interesting thing there (the reason the whole issue is brought)is how R Lieberman reconciled his scientific knowledge of the inauthenticity with his absolute utter loyalty to his rebbe the Riyatz. R Liberman loved books, and was close to beis harav, but he most certainly had his own opinions, and they did not have to match the Rebbe Rayatz’s.